Product received in consideration of review. All opinions are my own. If you’ve been around here a minute, you know I love The Beginner’s Bible for kids. We recently had the opportunity to review The Beginner’s Bible Deluxe Edition with CD, from Zondervan. The Beginner’s Bible is the 2006 Retailers Choice Award winner in Children’s Nonfiction. Full of faith and fun, The Beginner’s Bible is a wonderful gift for any child. Okay, so it shouldn’t really be a surprise that I absolutely LOVE this set. The Beginner’s Bible is one of our favorite children’s Bibles. 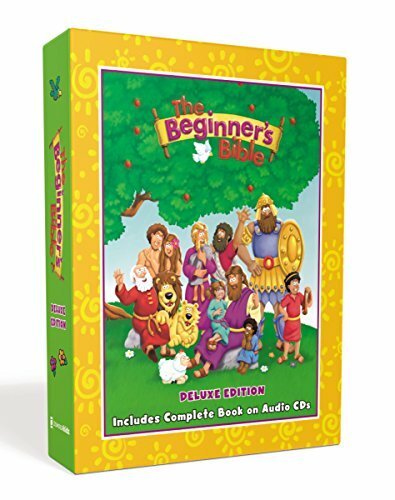 The Beginner’s Bible Deluxe Edition with CD is a timeless classic that kids will love. Listening to the stories on the go is super fun for kids. If you’re thinking about getting your little one a Bible for Christmas, move this one to the top of your list! The Beginner’s Bible Dexluxe Edition with CD is available wherever religious books are sold. Get your own copy on Amazon today.